Sean Brodrick writes:The term "nouveau riche," or "new money," refers to people who, through rapid acquisition of wealth, now have the ability to buy things that were previously out of their reach. In the U.S., it applies to individuals. But in Asia, it applies to entire nations . So today, I want to talk about how people in India and China are going nuts for high-end consumer goods, especially jewelry. China's economy is in overdrive, on track to expand 11.3% this year. The country will surpass the U.S. as the world's second-largest exporter, and in 2008, it will surpass Germany, the largest. China's per-capita gross domestic product has DOUBLED in just three years. The real growth is in the nouveau riche category. The number of Chinese with at least $1 million in assets hit 345,000 in 2006, up about 8% from a year earlier according to Merrill Lynch. And you can bet that number is increasing daily! At the same time, total assets owned by Chinese millionaires reached $1.7 trillion, increasing 8.8% year over year. In India, it's more of the same. The country is the world's fastest-growing major economy after China, with GDP rising at a rate of 9.4% in fiscal 2007. That's the strongest pace in 18 years! India's middle class now numbers more than 300 million people. That's roughly the entire population of the United States! India had 83,000 millionaires in 2006, and the number of millionaires is growing 19.3% year-over-year! So, what do you think the nouveau riche of China and India are going to spend their money on? Sure, cars, homes, clothes, air conditioners and consumer goods of all types are certainly some of the most desired items. China has a huge appetite for gold. But so are two other things that really interest me — gold and diamonds. China and India will likely help both of these natural resources boom! Global gold demand rose 30% in the third quarter of 2007 to a new record of $20.7 billion, according to the World Gold Council. And that was despite a 13% drop in sales in the U.S.! Reason: Buyers in emerging markets, including India and China, are coming out of the woodwork to snap up the precious yellow metal. India is absolutely crazy for the yellow metal! Last year, the two countries consumed 721.9 tonnes and 259.6 tonnes of gold for jewelry and investment, respectively. 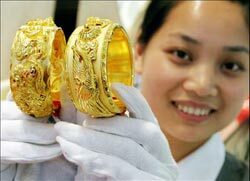 In China, gold jewelry demand increased 24% in the third quarter. Investment demand rose 46%. In India, already the world's largest buyer of gold jewelry, demand rose another 5.5%, and investment demand was up, too. Plus, research firm GFMS Ltd. says gold jewelry demand in China may increase 20% this year, making it the second-biggest market, even ahead of the U.S.
A Diamond Boom Explodes Overseas! Prices of quality diamonds have doubled during the past three years as new collectors from surging economies have entered the market. People in India have a long history of wearing expensive jewelry, but gold is the traditional choice. These days, diamonds are becoming more and more popular though. Check this out — India's diamond consumption is up 27% annually for the past five years! Of course, it looks like the diamond party in India is just getting started. According to reports, diamond jewelry sales surpassed that of gold during India's Dhanteras festival, which is devoted to light and wealth. 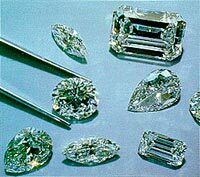 According to industry calculations, sales of diamond jewelry in India could surge 70% to 80% this year! First, color matters most. The grades are "light fancy," "fancy," "fancy intense" and, the most expensive, "fancy vivid." Go for a color grade no lower than fancy. Second, white diamonds are still the ladies' choice, but demand for colored diamonds has doubled since 1999, according to the Gemological Institute of America (GIA), one of the largest independent diamond-grading labs. Third, if you buy a colored diamond, you'll likely pay more than you would for an equal-weight white diamond because colored diamonds are more rare. However, some colored diamonds — brown and orange-yellow — are still attractive but have a smaller price tag. Fourth, make sure the stone has a lab report from the GIA or the American Gem Society Laboratories that is no older than six months . That way, you can be sure the diamond is natural and hasn't been irradiated to enrich its color. Fifth, when it comes to cuts, brilliant is the most popular cut. The shape resembles a cone and is meant to maximize light passing through the top of the diamond. But certain modified brilliant cuts are even better at maximizing the light in a diamond. Sixth, you can probably get a better deal shopping online for a diamond than you would in a brick-and-mortar store. You can even buy them on Amazon.com. Other well-known online diamond retailers include Blue Nile and Ice.com. China is no slouch, either. Diamond sales in China soared 70% last year. According to the Shanghai-based Diamond Administration of China (DAC) total imports and exports of diamond — plus turnover of the precious stone on the Shanghai Diamond Exchange (SDE) — hit $610 million in 2006, up 44% from 2005. Total trading volume in 2007 is expected to increase another 50% to $900 million. And while Communist leader Mao Zedong might turn over in his grave, it is becoming fashionable for Chinese couples to buy diamond rings for marriage. In fact, diamond wedding rings account for a third of all diamond sales in China, and that number is rising rapidly. Keep in mind, the country's Ministry of Civil Affairs says there are about 10 million new couples getting married every year. Boom times for diamonds? I should say so! If you're thinking of buying anything gold or diamond-related this holiday season, my recommendation would be an exuberant "YES!" After all, the Chinese wedding season starts around the Chinese New Year (February 7). That's probably going to drive prices up, and since we live in a global market, that includes prices at your neighborhood jewelry store. If you buy jewelry now, you'll be the smart money . Not only will you be making someone very happy, your purchase will very likely increase in value over the next year. Oh, if only more investments had such good odds! If you only want to buy a stock, not a diamond — you could always consider Tiffany (NYSE: TIF). The luxury retailer's third-quarter earnings more than tripled on strong sales growth. What's more, it's opening stores in ritzy spots around the planet, including China. It has four stores in Beijing and Shanghai, and plans to open two new outlets in the next two months. As for gold investments, here's another way to look at China. Not only is the country's consumption of gold growing by leaps and bounds, but its gold production is booming as well. China is expected to produce a whopping 260 metric tonnes of gold this year — more than U.S. production (250 metric tonnes) and potentially more than gold's top dog producer South Africa, which is running into real trouble with its mining. So take a good look at Chinese mining companies ... I think you'll like what you see. P.S. Gold and diamonds are great hedges against the falling dollar, but there's another extremely powerful way to protect yourself and profit in the process! To learn more, I encourage you to listen to Martin and Jack's 50-minute video, showing how to go for returns as great as 28 to 1! It's online now. And it's free. Just turn you computer speakers on, and click here .